Womens Institute in Hackney Wick!! 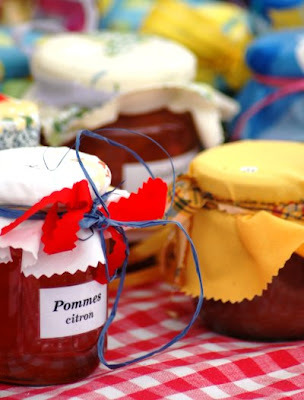 Calling all women in the Square… okay so the picture of the preserves is a little twee – but we have the opportunity to form a really interesting group here in Hackney Wick. The WI may conjure up images of baking cakes and charity calendars – but we can create a group that fits all our needs. Just imagine meeting new people and making lasting friendships with women who live right on your doorstep. Taking time out of from children, jobs and day to day stresses can all be just the therapy we need to make us feel human again! So why not come along on Monday evening (6.30pm – 8.30pm) for a cup of tea and a chat and we’ll see what great ideas we can come up with. Beating The Bounds - Great Day Had by All! The sun was shining on the Wick, and there was not a cloud in the sky as we embarked on our history walk with the wonderful storyteller Diana Olutunmogun. Thanks too to Lisa Rigg from Hackney Society for organising the walk and Elisabeth from Hackney Archives who supplied us with amazing photos and information of the Wick from days gone by. We were a bit light on crowds, but despite this, a really pleasant and fascinating afternoon was had by all. Beating the Bounds was an ancient tradition where people of the Parish would come out to walk around the boundary of the Parish. This would usually occur 40 days after Easter. People would take notes of hedges, streams, ponds, and even big trees. This was a time before maps, where it was especially important to show children these natural landmarks in order to keep them safe and familiar with their Parish boundary. The walk started here on our very own riverbank in Leabank Square. We have residents who have lived here since the very ‘beginning’ of the completion our Square (1989). But did you know that our canal was a hub of activity during the Industrial Revolution? The Wick was a very industrial place and the canal was a vital mode of transport for all the factories that needed to transport material and goods around London and beyond. The Hackney Wick Stadium across the canal, which opened in 1932, was host to many a greyhound races and the Hackney Speedway. But perhaps it’s more famous or infamous for its last reincarnation as a Sunday market. My family fondly recall the madness and chaos that was the Hackney Wick Stadium Market! Now, how often have you walked past our neighbours Atlas Wharf? Well, did you know that it was here that Arthur Green discovered a yellow dystuff called Primuline. The workers in this factory would have worked in a very perilous environment, as these dyes were toxic and breathing in the fumes would have made them very sick. Next stop was the blue plaque, which I’m sure most Wickites quote when asked what Hackney Wick is most famous for – Plastic! Yes it was here that one of the worlds’ most famous materials was created and it was called Parkesine after the person who invented it, Alexander Parkes. Another invention which may not be too obvious (no blue plaque!) was petrol. It was in White Post Lane that William Leonard and his partners’ pioneered petrol. The most intriguing thing is that they decided to call it Carless Petrol – a combination of names of the people involved in the invention. Elisabeth (Hackney Archives) showed us a wonderful black and white photo, which showed the company cars with the advertisements for Carless petrol on their sides. Stop 5 was just beside the old Queen Victoria pub where in the 1800s stood a beautiful mansion, Old Wick House. Hackney Archives hold impressions of this house which suggest a very grand old house indeed. There was a stream with mature willow trees, a bridge and lots of green space. This mansion belonged to Colonel Mark Beaufoy, who in 1821 set up in a hot air balloon from his garden and made it as far as Colchester! Perhaps the biggest treat of all came when we reached stop 6 on our tour map – St Mary of Eton Church. This was where Alan Piggot (Vicar of St Marys’) told us about how the church was set up by the Eaton Manor Boys – a group of wealthy Eaton college boys who wanted to do good for the poor of East London. We were then given an ‘unofficial’ part of the tour by being allowed to climb to the top of the church tower and absorb the wonderful panoramic views of the Wick! This was such a treat and it was so interesting to view the Wick from such a different perspective. Thanks again to Alan for this pleasure! Last stop were the Old Baths. Now housing our community centre, this was where in days gone by locals would have gone to get clean! Bath Houses were considered an essential public service in the early 1900s. Many Londoners did not have access to their own internal water supply before WW2. Percival Holt changed this for the people of the Wick when in 1934 the Gainsborough Rd Public Baths were opened. Holt was a true visionary who brought past locals a much needed service, with slip baths and a laundromat. The circular walk ended back on our riverbank, where we enjoyed one of the best banana cakes we had ever tasted, courtesy of Lisa Rigg who bought the cakes from Veneti’s Coffee Shop on Chatsworth Road. All in all, a fantastic way to spend a Saturday afternoon in the Wick! This short walk reminded us that we live in one of the most interesting and unique places in London today – a place which is going to experience some of the most profound changes it has seen, perhaps since the Industrial Revolution. The beauty of this circular walk was to highlight the aspects of our area that we may not be aware of. Buildings, people, ideas have come and gone. Sometimes legacies can vanish just as quickly – that’s why it’s so important that we all participate in forming the new changes coming our way. Hackney Wick is changing and we can all have say in how our story continues! Who could have been a more fitting visitor to Leabank Square on this Mothers Day - than Gili?! Looking for all the world like Mother Nature herself - Gili was walking along the canal - and thought to pop in to her old manor - Leabank Square. Gili was almost one of the original Leabankers who lived here in 1993. Back then Leabank Square was brand spanking new - and no-one had access to the riverbank yet. Guess what were the first words out of her mouth? Now if that isn't a fabulous endorsement for all the great things happening right here in Leabank Square - what is? Gili - please know that you are very welcome to come & visit anytime you want. Especially at the Hackney Wick Festival on Saturday 26th September (check out what we got up to last year at: http://leabanksquare.blogspot.com/2008/09/hackney-wick-festival.html). 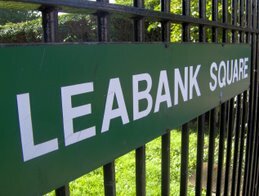 In the meantime - keep up with all the news from Leabank Square right here on the blog! You can either plant your seeds directly into the garden from April or, to get really tall plants you could plant them earlier indoors – anytime from March onwards. The seedlings would prefer to be acclimatised gradually to life outside. They prefer a sunny open site, but will grow in most sites and soils. Lots of love and affection will ensure that your plants grow up to 12 inches every day – so remember to pass on these measurements to us. Let’s see if we can break any giant sunflower records this year in the Square! Here's a few pics of the progress of the Olympic Stadium over the canal. It really is an impressive construction site on that site of the park. You really get a better idea of the whole scale of the park as a whole when you see the stadium being added to. Do yourself a favour - take a walk along the canal tow-path - and turn left up the Greenway path (still a bit grimy I'm afraid - come on Tower Hamlets!) - and when you get to the top - you'll see the stadium rising from the earth!! I know there are times when we get a bit antsy about the levels of noise & dust directly across from us - but seeing the stadium puts it all a bit more into context - you know?! You may have all noticed the sudden digging frenzy around the edges of the gated garden. Well, this is the start of our new garden borders. The coppiced logs from Wick Woods were donated by HMUG and have been used to contain the borders, in preparation for all the fantastic growing we will be doing this Spring and Summer. This year we will continue to grow our own herbs and vegetables as we did last year. Only this year, with all your help, we would like to grow a greater variety of vegetables. These will include pumpkins, watermelons,onions, carrots, potatoes, radishes, salad leaves, runner beans, peas, tomatoes. We would love to grow, parsley, coriander, fennel, chives and so much more! In preparation for all the watering required to produce a healthy crop of veggies, we are laying an irrigation hose in the borders. This will make the Summer job of watering the garden so much easier. Once the hose is laid out, we will need to fill the borders with plenty of compost, to give our seedlings the best chance to grow into the tastiest herbs and veggies. This is where we would like to make an appeal to all Leabankers to donate some compost for our gardens. So, the next time you are at you local B&Q, supermarket, Lidl or garden shop, please pick up a bag or two of compost and drop it off at number 71. Your donation will help to turn our Square into one of the most amazing places in Hackney this year! Olympic Noise!!! Hackney Council Complicit!! Thanks to all who attended the extra-ordinary meeting this morning. As you all know Hackney Council keeps granting the Olympics permission to work on Sundays. As everyone - especially those in the front 3 blocks - knows - the noise busy being generated from across the river has grown completely intolerable of late. But now Hackney Council has been letting us down by granting some 'section' or the other to the Olympics to do this very loud noise on Sundays as well. That means that there is a 7 day weeks' worth of excruciating noise for Leabank Square!! We have now had more than enough of it - and are in the process of getting a legal injunction taken out on Hackney Council - preventing them from granting these 'sections' to the Olympics. No doubt - Hackney Council will say that they have been 'consulting' with some of us - but if by that they mean that Sóna has the occasional telephone conversation with them about this matter - then that is by no means - any kind of 'consultation'! The conversation normally goes something like being told that the Olympics are a bit behind schedule because of something unforeseen - like British weather - and need to catch up on Sundays. Hackney Council then simply gives them permission as long as the Olympics stick within their limited decibel levels. This is the sole level of 'consultation being done with Leabank Square at the moment. And the Olympics know this. They also know that Hackney Council are not even monitoring the noise levels independently as their noise recording machine is faulty. So - when we eventually get the noise data readings from the Olympics themselves (currently 4 months late) - we will all see just how much higher they over the agreed levels - and have to have a 'conversation' about figures that are 4 months old - meanwhile newer noise levels are being broken. I know that we in Leabank Square do not find this situation acceptable - but how about our readers from outside Leabank Square? Please add your honest comments about whether you think we are being unreasonable or not. Poem © Ralph Rochester, 2009. Illustrations © Zara Slattery, 2009.
including local boxer Harry Mallin, the Eton Manor Boys Club,Hackney Speedway and loads more! Come and share facts and info that YOU know about your local area. A circular walk starting on our riverbank with loads of hot chocolate and cake provided. The walk is suitable for children 7 years and upwards, and their parents. This event is free, but booking is necessary. This project has been generously funded by the Museums, Libraries and Archives Council and Renaissance London; and supported by the Hackney Heritage and Built Environmrnt Partnership. 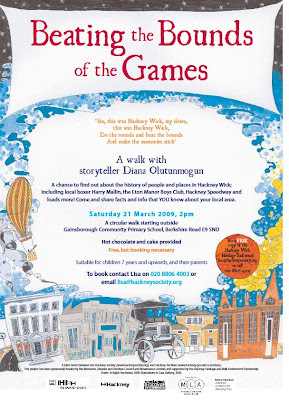 This is a joint event between the Hackney Society (http://www.hackneysociety.org/) and Hackney Archives (www.hackney.gov.uk/ca-archives). It might look like a planters worth now - but in no time at all - it will be a giant evergreen shrub from which we can take cuttings from for the whole of Leabank Square. Mary also graciously gave us loads of anemones as well and we have transferred them into medium planters until they get a bit larger - when we will start planting them in & around the green. Thanks heaps Mary - we all very gratefully appreciate you kind donations!! Is this the earliest Bumble Bee in Hackney?! While we were laying the borders, Safiri spotted this amazingly fat bumble bee rolling around in the pollen inside one of the first crocuses. S/He looked like they were having a bit more fun than the rest of us digging, lifting, turning, mixing, composting, planting, laying, measuring, positioning, etcing - our lovely new borders. I'll post a separate blog on the borders in a few days time, but in the meantime, enjoy this bumble bee. Check this amazing astro-turf out! This is a very kind donation from Simon over in Clapton. He has kindly given Leabank Square loads of astro-turf for our river bank. It looks as if it is going to be enough to cover the water over-flow pump that we all enjoy chilling out on. This is going transform the whole river bank for us. We can't actually grow grass there, so this is the next best thing. This is also the spot for Simon's (Leabank Square's Simon) annual book stall - so this year it'll look fantastic! Simon (Clapton's Simon) - thank you so very much for your very kind donation - please look out for it each time you cycle past Leabank Square! !